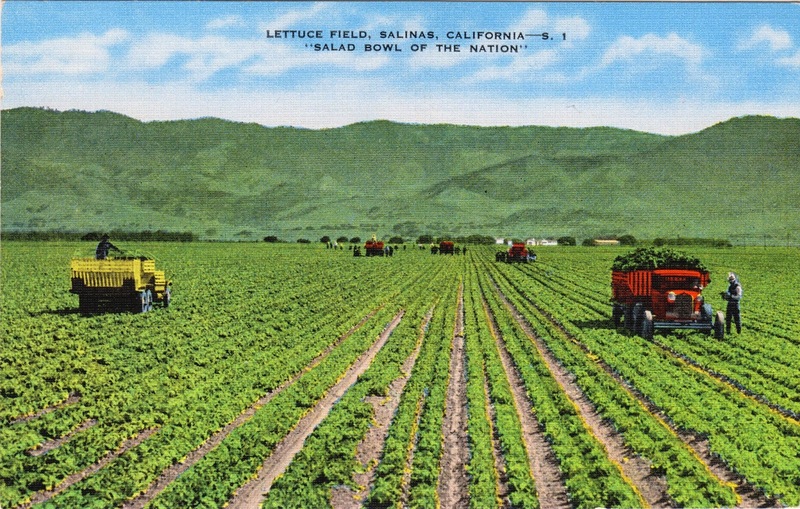 Outgoing postcard US-3169528 to California shows a lettuce field in Salinas, California. It reads on the back of the card: "Over sixty percent of the lettuce eaten in the nation comes from the Salinas Valley where they called it 'green gold.' With the longest growing season in the world, heavy shipments are made from April to December and lesser shipments during the other months." Salinas is the county seat and largest municipality of Monterey County, California, known for its vibrant and large agriculture industry. It is the hometown of Nobel Prize in Literature laureate John Steinbeck. According to Wikipedia, traditionally an Anglophonic European American settlement, Salinas attracted a significant Asian-American immigrants in the agriculture and fishing industries at the beginning of the 20th century. Hispanic immigrants primarily from Mexico drawn to opportunities in the area’s agricultural industry since 1960s and established a large Mexican-American enclave in the neighboring area. Along with the great influx of legal immigrants, it comes an influx of undocumented immigrants. By 2011, Salinas had one of the highest concentrations of undocumented immigrants in the state and nationwide.